OKLAHOMA CITY (January 10, 2017) — Hilldale Elementary School in Putnam City Schools — the fifth-largest school district in Oklahoma — is known for turning around student achievement. Today, an all-school assembly was turned on its head when first-grade teacher Amanda Raupe was called to accept a $25,000 Milken Educator Award for her contributions to the school’s significant achievement growth. Milken Family Foundation Senior Program Administrator Greg Gallagher presented the recognition to Raupe, joined by State Superintendent of Public Instruction Joy Hofmeister, Oklahoma Secretary of Education and Workforce Development Natalie Shirley and Putnam City Schools Superintendent Dr. Fred Rhodes. Raupe is the grade-level team leader and a school leadership team member. She is considered a vital contributor to turning Hilldale — a high-poverty pre-K through fifth-grade school — around. In addition, more than half of the students are English learners (ELs). As such, Raupe dedicates core classroom time to phonics and phonemic awareness, as well as refines her math instruction with a grant she received from the Oklahoma Educators Credit Union. Students catch up in her class, with each surging up at least four levels on reading assessment tests in one year, and many jumping to eight levels — double the expected growth rate. Hilldale’s student achievement progress in reading and math over time recently earned it the designation of Oklahoma Reward School and raised its state report card grade from a D in 2012 to a B in 2015. Raupe familiarizes her students with assessments early on, studying data regularly and using it to create small, flexible learning groups that change as students reach their learning targets. Raupe is known as a go-to person at Hilldale for thoughtful, high-impact ideas born of intense research. Solutions-oriented, she has led recent changes in the school’s literacy program, poring over new textbooks and materials and studying the rubric in order to make data-driven, substantive recommendations. Raupe mastered the LETRS (Language Essentials for Teachers of Reading and Spelling) curriculum, completed its training modules, and helps colleagues implement the new curriculum in their classrooms. Raupe’s expertise and mentoring capabilities extend to Putnam City Schools and the community at large. She is a member of the district’s English Language Arts curriculum team, has mentored future educators from nearby universities and has contributed to presentations at national literacy conferences. Raupe earned a bachelor’s degree in elementary education from Oklahoma State University in 2011. 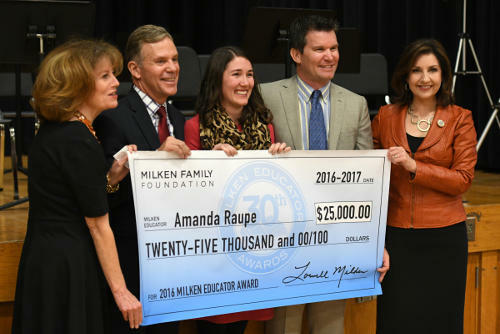 More information about Raupe, plus links to photos and a video from today’s assembly, can be found on the Milken Educator Awards website at http://www.milkeneducatorawards.org/educators/view/amanda-raupe. Milken Educators are selected in early to mid-career for what they have achieved and for the promise of what they will accomplish. In addition to the $25,000 prize and public recognition, Raupe’s honor includes membership in the National Milken Educator Network, a group of more than 2,700 top principals, teachers and specialists dedicated to strengthening education. In addition to participation in the Milken Educator Network, 2016-17 recipients will attend a Milken Educator Forum, March 23-25, 2017, in New Orleans. Educators will have the opportunity to network with their new colleagues and hear from state and federal officials about the importance of maximizing their leadership roles to advance educator effectiveness.